I watch Lito Rodriguez, a Mexican action movie star, take the stage at the São Paulo Pride Parade. Recently, sexually explicit photos of him and his partner were publicized without his permission, launching him out of the closet and into public scrutiny. His film career is collapsing around him, but he accepted the invitation to speak at the parade. He looks nervous and exposed, framed by a rainbow of balloons. But then, he finds his courage. “All my life I’ve had to pretend to be something I wasn’t,” he begins. “And to become what I wanted to become I couldn’t be what I am.” He hesitates, looking over to his partner. And then: “I am a gay man.” He smiles. I can see the relief in his eyes, the freedom of finally being out on his own terms. “I’ve never said those words in public before. I am a gay man!” He shouts it over and over, embracing any potential consequences for his career, his safety, and his relationships, as the crowd cheers. I am moved to tears by his courage, his joy, and his love. Lito is fictional—he is a character on the Netflix original series Sense8, played by Miguel Ángel Silvestre. But his story has real and powerful effects, and his pride parade speech did make me cry. 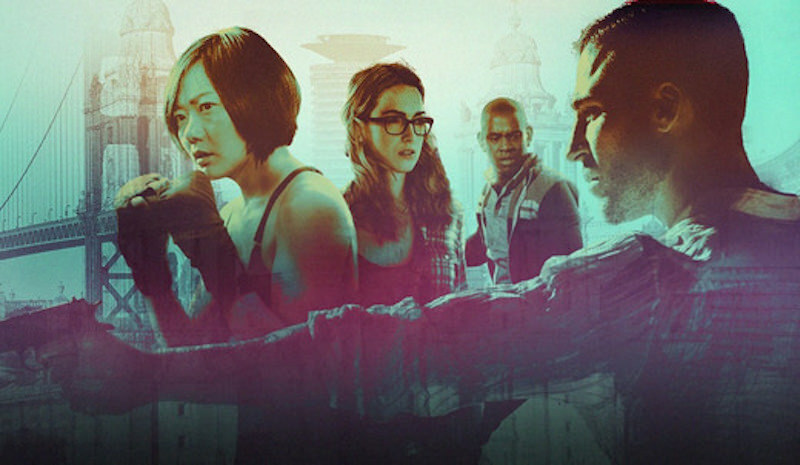 The second season of Sense8, released in May, was the perfect relief from today’s political climate: a diverse, hopeful story about love, empathy, and the power of human connection. Sense8 is the story of eight people across the globe who become psychically linked, and use their connection to fight against a mysterious organization that’s determined to hunt them down. But it’s the characters and their compelling personal journeys that have given the show its passionate following. Even when the storytelling may slow or the mythology may get jumbled, the ensemble, which is exceedingly diverse in race, gender, sexuality, and life experience, can still capture viewers’ hearts. Which is why it came as such a shock when Netflix cancelled Sense8, less than a month after the release of the second season. Fans were furious, and even started a petition to get the show renewed, or at least to get an explanation for the cancellation. Netflix has been very cagey about the decision. Cindy Holland, VP of Netflix original content, said in a statement that there has never been “a more truly global show with an equally diverse and international cast and crew” but that the show “is coming to an end.” There’s some speculation that the show simply didn’t have a large enough viewership. Netflix doesn’t release its viewership numbers, but Netflix CEO Reed Hastings implied that the shows that get cancelled (of which there have only been four) are the ones people aren’t watching. But when combined with Netflix’s recent cancellation of The Get Down, a musical series about the birth of hip hop in 1970s New York (which doesn’t have a single white person in the main cast), the decision seems suspect. People are wondering why Netflix is cancelling shows with such important minority representation. Sense8 starred Jamie Clayton, a trans actress, as Nomi Marks, one of the few trans characters on TV. At the end of the second season, Nomi had just gotten engaged to her girlfriend Amanita. Now we will never see their wedding. In the past, Netflix has been praised for its commitment to diversity, demonstrated by shows like Narcos and Orange is the New Black. But is Netflix any more committed to diversity than the competing cable networks? I looked at the shows from the 2016-17 season that Netflix is renewing, and compared them with the shows that The CW is renewing on three metrics of diversity: LGBTQ representation, racial minority representation, and female leads. On the first two counts, Netflix clearly does worse. While the CW has a queer character in the main cast of 55% of their renewed, scripted shows (plus a recurring queer character in an additional 27%), Netflix has a queer character in the main cast of only 29%. And while the CW has at least one person of color in the main cast of 91% of their renewed, scripted shows, Netflix meets this low bar with only 57%. Ideally, half of shows should have a female lead, and 48% of Netflix’s renewed, scripted shows do have a female lead (as compared to 45% of the CWs). But women aren’t very active behind the scenes at Netflix—less than 20% of Netflix’s writers, directors, and creators were found to be women in a 2016 study. Netflix is getting better. In the 2016-17 season, it put out some amazingly progressive shows like One Day at a Time (about a Cuban American single mother, with a lesbian daughter), Grace and Frankie (about two 70-something women who are thrown together when their husbands declare their love for each other), Marvel’s Luke Cage (about a black, ex-con, bulletproof superhero), and Dear White People (about a group of black students at a primarily white Ivy League university). But the commitment to diversity they claim to have, means they need to stick by bold, diverse shows like Sense8 and The Get Down, even when the ratings aren’t what they hope. These stories are important—they treat people of color and queer people like human beings, in a world where these people are increasingly marginalized. As Lito Rodriguez says in his speech at the São Paulo Pride parade, “whatever it costs to be able to [kiss my boyfriend in public], I know in my heart that it is worth it.” Netflix needs to decide whether telling the stories of marginalized people is worth the risk. Because if Netflix only tells these stories when the ratings are good enough, that’s not really commitment to diversity at all. Lulu Klebanoff is a legal intern at Legal Voice, and a rising sophomore at Yale University. In her free time she loves doing improv, writing, petting dogs, and slowly dismantling the heteropatriarchy. She is, admittedly, an avid bingewatcher of television, especially when that television has queer characters.